With each of these pools you get a grand pool kit, which includes: 2mm thick ground felt, external wooden stairs and an internal ladder for easy access, a 2' x 20' solar panel heater kit, a thermal cover and a 4m 3/hour sand filter. 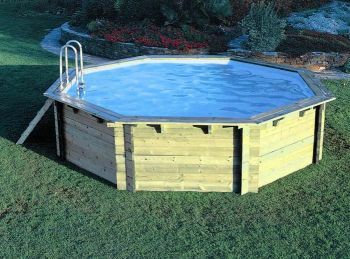 With 45mm thick treated pine timber for your pools wall construction, designed with tongue and groove planks to simply interlook, along with decking planks for the top of your pools finish and a simple yet strong and flexible 0.5mm thick PVC liner (which is treated against UV rays), this wooden pool is easy to assemble and one of the fastest wooden pools to set up ready to jump in a use. The pool must be sited on level, smooth and firm ground, we recommend setting up on a concrete base as the best option for this type of swimming pool. Not only do you get a list of pool extras with this beauty but you also get a cracking 10 yea warranty for the timber to protect you against insect damage and wood rot. Thats not all! You also get a 1 year warranty on all other parts against manufacturing defects. To help keep your pool in top condition it is highly recommended that you do NOT sink this model of swimming pool into the ground. PLEASE NOTE: The pump and filter need to be located 3.5 metres away from the pool and must be connected to a suitable weatherproof RCD-protected socket outlet. The pump is 400 watts. We recommend that filtration is turned OFF when the pool is in operation. We recommend a smooth concrete slab as a suitable base- contact a reputable local builder for advice on local soil conditions. Failure to set up the pool on a flat, level compact ground could result in the pool's collapse or the possibility that a person lounging in the pool could be swept out. Do not lean, straddle or exert pressure on the inflatable top ring or top rim as injury or flooding could occur. Do not sit on, climb or straddle the sides of the pool.